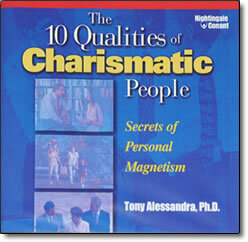 10 Qualities of Charismatic People CD by Tony Alessandra – Discount! Did you ever notice that when some people walk into a room – all heads turn? Or when some people speak – they captivate everyone around them. And how about the type of people who when you shake their hand, you instantly trust them … believe them … and like them! What’s their secret? What do they have that most people don’t? It’s called …charisma — undoubtedly one of the most desirable qualities in the world. And you’re able to easily get what you want, because people instinctively want to help you! Charisma is easy to spot. And at the same time it’s not so easy to put your finger on exactly what it is about a person that makes him or her charismatic. It’s an attractiveness that goes beyond good looks, an appeal that can’t be labeled as intellectual brilliance or a terrific sense of humor. Most people see it as something elusive and unachievable—a kind of magical, mysterious magnetism that you’re either born with or not. And the fact is that nothing could be further from the truth! Charisma is not based on genetics, IQ, social position, or luck. It’s actually a skill. And anyone can learn and master it. Tony’s research uncovered 10 Universal Keys to Charisma — 10 specific qualities that are present in each one of us, but are all highly developed in truly charismatic people. The secret to becoming an extremely charismatic person is identifying these 10 qualities within yourself and learning how to develop each one as fully as possible. In The 10 Qualities of Charismatic People, you’ll examine each of these 10 keys in depth. Powerful real-life examples of charisma in action will help you understand why these skills are so vital to your success. Quizzes, exercises, and anecdotes will help you assess your current level of ability in each area. And you’ll learn specific techniques, skills, and strategies that target each area and that will help you develop each one to your maximum ability. Once you do, that magical, mysterious power that attracts people and wins them over will be yours! But by learning how to maximize the aspects of her personality that had the most potential, she blossomed from “Shy Di” into an international icon. Beloved by millions around the world, the power of her presence went much deeper than her beauty, confidence, or title … and it enabled her to gain tremendous financial and media support for the humanitarian causes most important to her. In this program, you’ll discover all the tools you need to experience this same kind of profound personal transformation in your own life. Charisma gives you a tremendous advantage in almost every conceivable situation, from business meetings and sales calls, to getting your kids to do their homework or getting the cooperation of a store clerk or teacher. Just imagine how much easier your life will be when people are instantly drawn to you and automatically want to help you. You’ll be able to inspire people, ignite their enthusiasm, persuade them to see things your way, and do what you want them to—without creating defensiveness or resentment. Whether you’re running a corporation, a department, a classroom, a volunteer program, or a household, there’s no skill more valuable than the ability to positively influence others. You already have the potential to be more charismatic. Once you unlock it, you’ll have an extraordinary edge in life shared only by a select few. Utilize the power of “charisma” for yourself.